Why deleted files can be recovered? Deleting files is a rather normal computer operation and almost all computer users have deleted data from computer. File deletion is an easy way to help you free disk space so that you can save new data. Some users delete files for the sake of protecting privacy, as they believe deleting files is able to prevent others from viewing them. However, the truth is that deleted files can be recovered with certain methods even though files have been deleted from Recycle Bin. Reasons behind file deletion vary from one to another, but many times files are deleted by accident. For instance, you just deleted a file and then realized that it is still of some importance or you just carried out a wrong deletion. Then you need an effective approach to recover deleted files at the least cost. We recommend you the following content which tells how to get back deleted files step by step. There are plenty of reasons that people delete their files, also files can be deleted in many ways. Most of times lost files can be restored, for they are not permanently erased from storage devices. There is a "Delete" key on keyboard of every computer, and you can select a file you want to wipe and press this key. Then you'll get a message box asking "Are you sure you want to move this file to the Recycle Bin?" If you click "Yes" and the file will be removed to Recycle Bin. Deleting files is one of the most basic actions and it is quite easy to do it. You can delete one file or thousands of files at a time. Select files you want to delete and right-click mouse button to choose "Delete" option. This option works the same as "Delete" key and it puts files to Recycle Bin as well. When you delete files you can use key combination "Shift + Delete" which deletes files bypassing Recycle Bin. Files won't be moved to Recycle Bin but get deleted directly. This method is equivalent to emptying Recycle Bin. Though it is often called permanently deletion, deleted files are still recoverable. Apart from deletion ways mentioned above there are many other cases that can cause data deletion. For example, when you use "Cut - Paste" to move files, files will be deleted from its original location; computer is infected with virus or malware, files may be deleted by virus; delete files using third-party programs without user knowledge. With so many file recovery tools on the Internet, you may wonder what magic they do to restore deleted files. Why deleted files are recoverable? What's the recovery process like? Can anyone do it at home? The follow section will give answers to these questions. How does computer delete files? Files are stored on hard drive sectors as blocks of data, and these sectors on hard drive can be placed in sequence or scattered randomly on drive's platters. For examples, when system stores a file which is too big to be stored on an uninterrupted block of sectors, system will fragment the file and write its parts to other unoccupied blocks. Operating system keeps track of data via pointers. Files stored on hard drive are managed and indexed by file system which records detailed file information, including file name, size, properties, exact sector location on the disk, etc. When Windows deletes a file, it removes pointers from file system to tag it as "deleted" and marks sectors holding file's data as free so that they can be reused to store other files. From the perspective of Windows, the deleted file is no longer viewable on hard drive and sectors once containing data are free space again. Thus the file deletion process does not erase data permanently. Operating system only modifies file information in file system and mark sectors occupied by deleted file as available. However, if there are new files to be stored, system may write data on any sectors marked as available. Saving new data may overwrite deleted files, after which deleted files won't be recoverable. Again you may ask why computer does not erase files off hard drive when it executes deletion operation. The reason is to save time and increase performance. The way Windows deleted files mentioned in previous part is really fast process. On the contrary, it takes long time to erase data off sectors. For instance, deletion of 5GB data will be finished in a blink of eye, while erasing file content may spend several minutes, which is just like writing 5GB data to hard drive. If you want to wipe data totally, you can use PartitionGuru to delete files permanently. What happens when system delete files from SSD? File deletion on solid state drive is another story. Solid state drive catches on these years and trim command is known to more people. To increase SSD's life, we should try to minimize writing to it as much as possible. SSD manufacturers do the same thing and then trim is used by almost all SSDs. When a file is deleted from trim-based SSD, system informs SSD that the file is deleted with trim command. Then sectors containing data will be erased immediately and can never be recovered. Recycle Bin is Windows built-in tool to store deleted files so that users can easily restore files from it. The previous section has mentioned that files deleted by pressing "Deletion" key or "Deletion" option on right-click menu are put into Recycle Bin. In fact, Recycle Bin is designed to hold deleted files temporarily, so that you can always restore files any time as long as files haven't be further deleted from Recycle Bin. 1. Open Recycle Bin by double clicking its icon on desktop. 2. Find out needed files. If there are so many files there, you can search file name in the "Search Recycle Bin" box, or sort file by name, deleting time, size, file type, etc. 3. Select files you need and right click them to choose "Restore". Then files will be restored to their original location before deletion. Data backup is one of the most important ways to protect data from loss or damage. Data loss happens in many ways and backup can save you from losing precious data. Backing up data means making a copy of important files and it will come in handy when original data is lost or damaged. Usually, backup is stored at a secure location which is different from original data. If backup contains files you need, you can restore file by copying them to computer. If your Windows is set to automatically create restore points, you can try recovering data from previous versions which also called shadow copies. 1. Open Windows Explorer by double click "Computer" on desktop. 2. Find the folder that used to store lost files and right-click it to select "Restore previous versions". If lost files was at the top level of a partition, right-click the partition. 3. You can see a list of previous versions available and select one you want to restore and click "Restore" button. For instance, if the file was deleted today, choose the version of the folder from yesterday when the file has lost. 4. Drag the file you want to restore to another location to save it. Don't despair even though you can't find lost files in Recycle Bin or do not obtain backup. There is also other ways to help you get back lost files. You can seek help from data recovery specialist or recovery software to restore deleted data. Data recovery company is an effective but not perfect solution. Those company provides professional recovery solutions, and yet they always charges high. Besides, your privacy may not be protected well compared with recovery by yourself. The best solution is undeleting files with recovery software. Deleted file recovery software is usually easy to use and recovery process requires simple steps. Some recovery software provides professional technical support and offer free remote assistance which is also done by data recovery specialists. 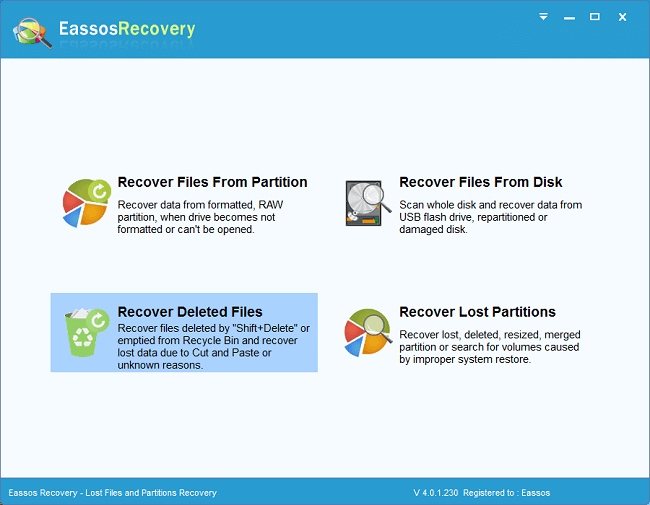 Eassos Recovery Free is free recovery software developed to help users recover deleted or lost files and partitions. It carries out deep scanning with sophisticated algorithms to find out as many as files. It provides file preview feature so that you can identify and examine files before actual recovery. Eassos data recovery software is fully compatible with IDE, SATA, SCSI hard drives, external hard drive, memory card, USB flash drive, cellphone, etc. If you are troubled by data loss problem and want to get files back, you can read on and learn recovery solution. 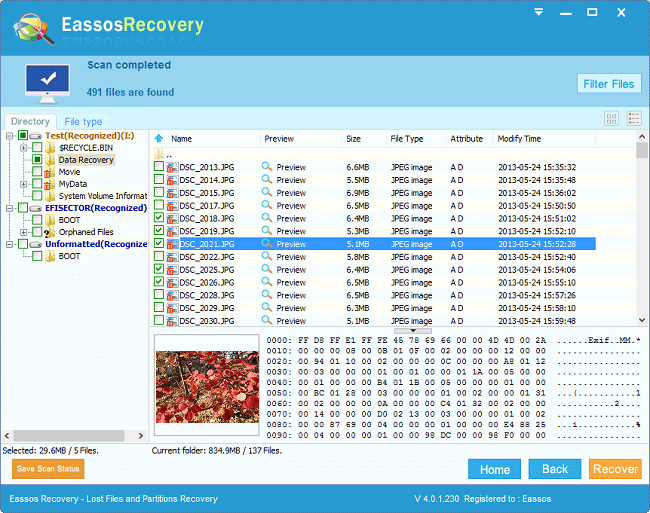 Eassos Recovery Free is secure and effective software and it undeletes files with easy steps. Download and install Eassos Recovery Free. Be aware that the software shouldn't be downloaded or installed to the disk that contains lost files. Otherwise, lost files will be overwritten and become unrecoverable. Start the recovery software and you can see four recovery modules on the interface. Since you want to do deleted file recovery, you should click "Recover Deleted Files" button. Select the partition that needs recovering data and click "Next" button to start scanning. If your files are listed during scanning, you can preview files. When all deleted files are found out, you can pause or stop scanning and get files recovered. Select files you need and click "Recover" button so as to save files to a secure location. As we all know, recovering deleted files can't always be successful due to for some reason or another. You should note that these ill-considered actions are likely to lead to permanent data loss. You should keep in mind the following includes dos and don'ts when you encounter data loss in order to maximize recovery possibility. You have to face the fact that data loss has already happened and your photos, documents, videos, etc. are lost. It's understandable that you are frustrated and distressed, but people suffering from data loss tend to carry out incorrect operations such as perform system restore. Stay calm when you stuck in file loss problem even though you do not know how to perform file recovery. Analyze current situation and prevent data overwrite. For example, stop using computer or saving new data to the partition that needs recovering data; if deleted files were stored in system partition such as desktop, you should shut down computer at once. Then disconnect hard drive and plug it to another computer to recover data. Check whether data loss is caused by physical damage on storage devices. For instance, if hard drive makes clicking noise, there must be something wrong with heads. You should turn off computer as soon as possible and send it to professional recovery center to retrieve data. Figure out an easy and effective way to undelete files. For the moment, the most frequently used way is using data free recovery software or employing a recovery company. Don't wasting time in regretting or blaming. Just pull yourself together to find out solutions to get back lost files or folders. Do not perform any operation that involves file overwrite. Lost files will become unrecoverable if hard drive sectors containing lost data are reused to store new data. Do not install recovery software to the partition where lost files were stored, and do not start recovering process before reading user guide. Do not hit or tap hard drive on purposely, as that may damage hard drive head and lead to severe physical problem. Do not format or defrag hard drive. Those operations can affect recovery result or even make lost files unrecoverable. Do not browse the Internet on the computer in questions, as browser saves cache to hard drive and cause file overwrite. "I tried five recovery programs downloaded online, and Eassos Recovery is the only one to recover all delelted files. I'm going to buy the full version to have it for good." "I was unable to recover deletes photos from my phone using your guide here. The software can't recognize my phone after I chose a recovery mode. Please help me out." "What can I do with the trial version instead of free version? Is it able to recover lost data?" Eassos Reply: The trial version is able to free scan and preview files. If you find your data on scan result and want to recover data, then you can purchase the software and the license code will be sent to your email. "I'm now trying to recover deleted images from a damaged memory card and the scan seems to be stuck at 80%. Is there something wrong?" Eassos Reply: It seems that there is something wrong such as bad sector near that area on your memory card. If your files have been listed in scan result, you can stop scanning now and save files to computer. "My phone contains a SD card which has a lot of photos and videos. But I deleted everything on in while I was updating system for the phone. Because the phone didn't work well these days. Please tell me how can I get photos back?" Eassos Reply: Please do not store data on the SD card before everything is recovered. 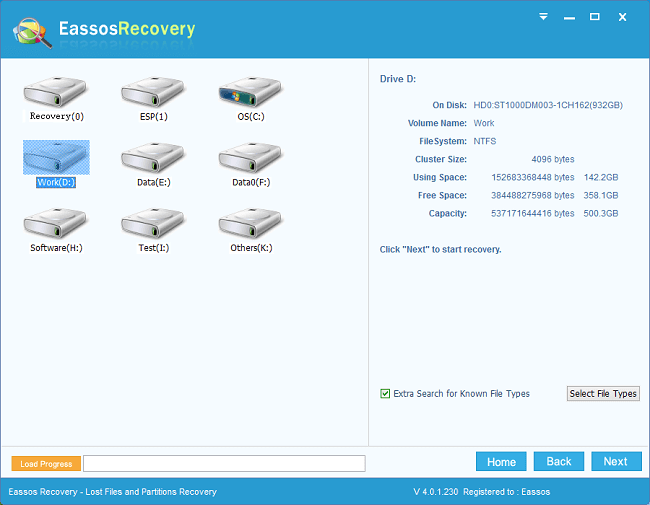 You can use "Recover Deleted Files" mode of Eassos Recovery to restore lost data. "Data loss problem happened to me yesterday. My files were deleted by mistake, but I really need them. I checked Recycle Bin but found nothing. After searching online, I found out your guide. I followed steps to recover files from my flash drive. It's lucky to have your article saved in My Favorite folder. Thanks!"